I am excited to share this picture of my home with you. This corner has been in progress for about 2 months and is finally complete! Since we moved into our home in late April of 2014, I have been working on decorating all the nooks and crannies. This picture is one from my new favorite areas in my dining room and I finally finished it just last night. 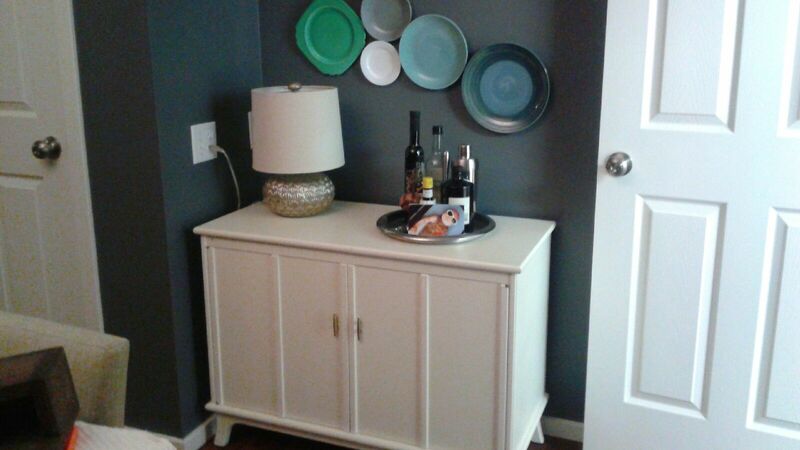 Next, I found this cute lamp from Home Goods and I think it looks really great with the silver tray. It brings the space together without being to matchy-matchy. Lastly, I have been collecting plates for awhile in colors that I love and that fit our home’s decor. I found some of these at Value Village, Good Will, Target, and Home Goods. It felt like a little scavenger hunt searching for the perfect plates!! Very rewarding each time I found just the right one! Well – that’s all for today! Thanks for reading! < Previous Tomorrow’s a New Beginning! Lovely ! Very well put together. The cabinet has a new face and a new life. it’s a great corner, i love the shape of that piece and the colorful dishes above.